Photo, from left to right: Dr. Amy DeMelo, president of Cox College; Eddie Marmouget, national industry partner for BKD’s health care practice; Andy Williams, partner in BKD’s health care practice; and Lisa Alexander, president of the CoxHealth Foundation. In just a few short months, Cox College’s revitalization campaign is already past $2 million in committed support – and the figure that put it over the line was $15,000 from the BKD Foundation. The donation is part of Cox College’s $6.6 million capital campaign, which will completely renovate the facility. Located adjacent to Cox North Hospital in the heart of one of Springfield’s historic districts, the college’s administrators seek to increase the students it trains – and future health care professionals — as “Baby Boomers” retire. Revitalizing the campus will allow for greater classroom space, and will help increase the cap of how many students the Missouri State Board of Nursing allows the college to accept. Cox College has one of the largest numbers of nursing licensure seats in southwest Missouri, but more nurses are greatly needed across the region and state. The Missouri Hospital Association has reported in 2017 that nursing vacancies statewide are up 6 percent over last year. 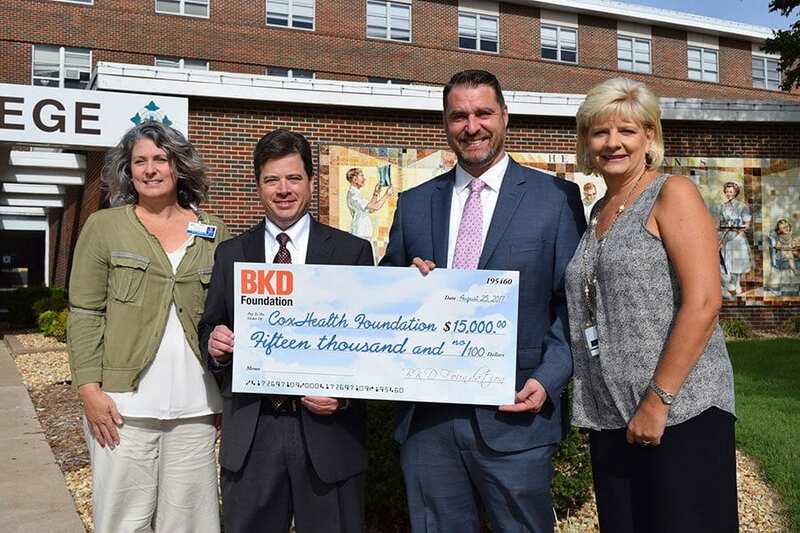 In addition to the BKD Foundation’s donation, $50,000 from the Sunderland Foundation, $150,000 from the Ferrell-Duncan Clinic Foundation and $100,000 from the Cruse Trust have been recently received in support of nursing education. In total, the campaign is now at $2,152,353 and climbing.